Tipping points: those elusive moments when a technology goes mainstream. Much has been written in the debate over whether that moment for renewable energy has passed, is fast approaching, or is still a ways away. The true tipping point will only become apparent in the rear-view mirror, and it won’t be defined by a single moment or breakthrough. It will be crossed at different times, in different countries, driven by different forces. But the clean-energy transition now appears irreversible, as we document in a new report at Clean Energy Canada. In developed and developing countries alike, fossil fuels are falling out of favour as a source of electricity. They are being beat out by renewable power that is clean, increasingly cost-competitive and a fast-growing source of economic opportunity. Since 2011, annual investments in renewable electricity have exceeded those in fossil power – and total nearly $2.5-trillion over that time span. The world’s three largest electricity markets – China, the United States and India – have all aggressively pursued renewable power and were collectively responsible for half of global clean energy investment in 2016. In both China and India, renewable energy offers a critical solution to the pollution choking fast-growing cities. Smog has become increasingly disruptive – socially, economically and politically – closing schools in Delhi, grounding airplanes in China and contributing to the premature deaths of millions of citizens. Helping other countries increase their use of renewable power may be where Canada finds its niche – and economic opportunity – in the global clean-energy transition. In 2015, the amount of solar power installed in China set a world record. China smashed that record again in 2016, adding 30 gigawatts (GW) of new capacity – or roughly enough solar panels to cover three soccer fields every hour. In India, remarkably low-cost renewable auction bids drove new solar capacity (which more than doubled relative to 2015) to become the second-largest source of new power in the country. India also built the world’s largest solar plant, covering 10 square kilometres and providing 648 megawatts (MW) of clean electricity capacity. In the United States, the renewable energy sector has become a major job creator. Since 2009, the solar industry has created one out of every 80 new jobs, and the country’s fastest-growing occupation is wind-turbine technician. While President Donald Trump promised on Tuesday to bring back coal jobs, he will no doubt find resistance – in both Congress and statehouses – should his efforts come at the expense of clean-energy jobs. While total global clean-energy investment fell in 2016 from the record-breaking total in 2015, new renewable-electricity capacity rivalled the previous year. Sustained policy efforts by governments, coupled with the continued drop in clean-energy technology costs, have created the conditions for more clean electrons to be squeezed out of every dollar spent. Global growth in renewable energy remains policy-driven, but increasingly that policy is harnessing the competitive forces of the market. This approach has further driven down costs and inspired technology innovation, new business models and market design. Competitive auctions for contracts to build new renewable-energy projects are leading to record-low prices that increasingly undercut their fossil-fuel competitors. But the evolution of our electricity system is not without its challenges. They range from decentralizing supply, to integrating variable sources of power such as wind and solar, to building new transmission lines connecting power-rich regions with those in need of clean electrons. China serves as a good example: In some regions, wind farms and solar fields are being built faster than they can be integrated, leaving them stranded from the grid or forced to reduce output. 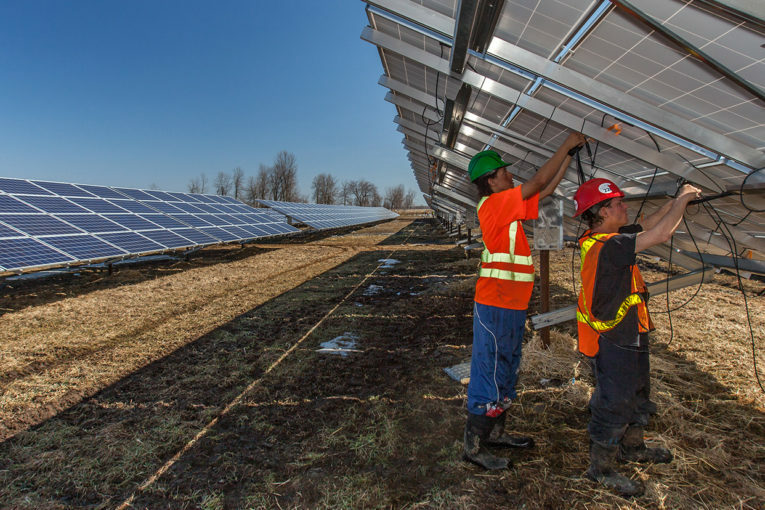 Investment in renewable power waned in Canada in 2016, as our electricity system is already dominated by power from fossil-free sources and electricity demand is relatively stable. But we know from experience how to harness and maximize the value of renewable electricity. We have a clean-energy technology sector that punches above its weight and companies hungry to sell their solutions beyond our borders. Helping other countries increase their use of renewable power may be where Canada finds its niche – and economic opportunity – in the global clean-energy transition. As the U.S. government retreats from international climate diplomacy, clean-energy innovation and free trade, it leaves a gap that Canada is well positioned to fill. And it’s clear that if we don’t step up, somebody else will. This article was co-written by Dan Woynillowicz and originally appeared in the Globe and Mail.